Cullen’s paintings are raw, aggressive and angry with, at times, a narcotic intensity. They are also empathic, melancholic and expressive. In many paintings, beauty can be found in such formal elements as his use of colours, the ways paint is applied to canvas, how people, words and things are arranged on the monochromatic backgrounds. The pathos of his subject matter also has a form of abject beauty, the beauty of the decayed and coming apart, of a humanity that is to be found in failed endeavours, misunderstandings and missed connections. In ‘Comedic relief’ laughter is no longer the best medicine. The man with downturned mouth looks on at the walking female figure whose head is obscured, appearing wrapped in bloody bandages. The antennae on the head of the man appear in many of Cullen’s paintings, receivers of the information with which we are bombarded daily from news as infotainment to gossip mags, the internet, radio, newspapers and the words that fill the urban environment on signs and hoardings. In Cullen’s work the ability to make sense of this information seems to break down as if our moral and ethical junk mail filters have been turned off. This is a fine example of Cullen’s reduced but powerful visual language, where graphic lines are coupled with expressive pours of paint: the man seems to melt downwards while the female figure moves in other directions. They seem caught in the human drive to connect, though failed desire and miscommunication is the result. Cullen encapsulates a particular experience of contemporary Australia. He depicts a psycho-geography of life as it is lived if we strip away all the advertising jingles, breakfast television, political rhetoric and good intentions. 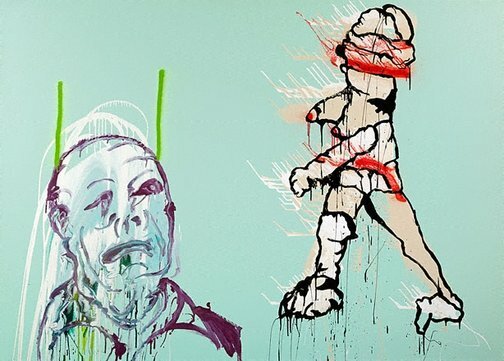 In taking away these crutches for living he replaces them with his own version of ‘palliative care’, this world of brightly hued misfits and misanthropes recorded or invented in acrylic on canvas. His art can have all the nihilism of teenage anxiety, but then again does life get any better than this? While Cullen may point to what he sees as being adrift in our society, he also replicates these same traits in his work and doesn’t exempt himself from the satire he levels at others. There is no outside to these paintings and the space they depict, and we all live in the same world they make manifest – whether we see it or not. Katrina Strickland, The Australian financial review , 'Silent departure of an energised but disorderly artist', pg. 52-53, Sydney, 31 Jul 2012, 52, 53 (colour illus., cropped). NOTE: the article appeared in the 'Features' section of the newspaper. Look , ‘Gone but not forgotten’, pg. 10, Sydney, Oct 2012, 10. Wayne Tunnicliffe, Adam Cullen: let's get lost , 'Let's get lost', pg. 8-20, Sydney, 2008, 16, 56-57 (colour illus.). Adam Cullen: scars last longer , 2004, 87 (colour illus. ).